Since 2009, ARPA-E has provided approximately $2 billion in R&D funding for more than 800 potentially transformational energy technology projects. 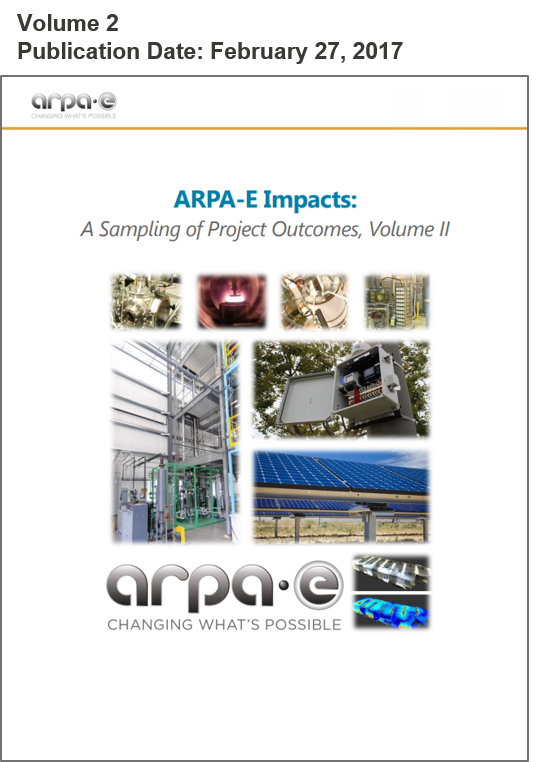 ARPA-E analyzes and catalogues some of the Agency’s most successful projects through its “impact sheets,” which explore a sampling of individual projects and their achievements. The Agency’s first compilation booklet of impact sheets was published in 2016, a second volume was released in 2017, and a third volume in 2018. Click the thumbnails below to learn more and download a PDF copy. 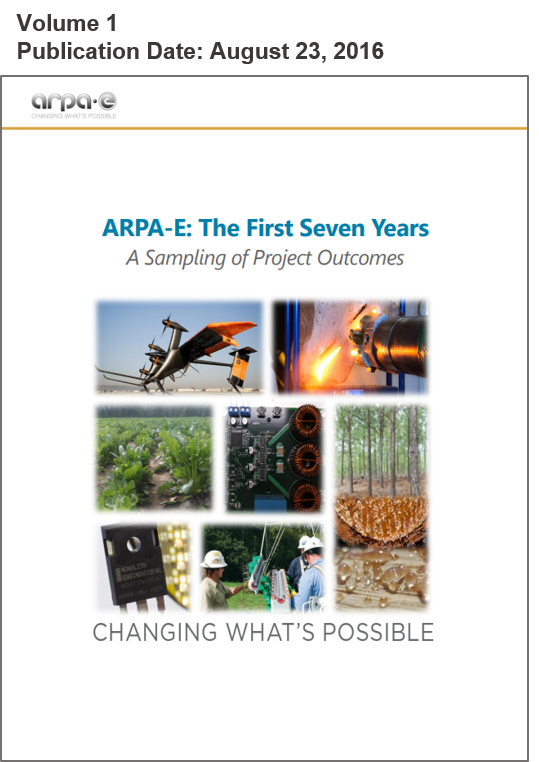 ARPA-E tracks key early indicators that help illustrate how the advanced R&D funded by the Agency can potentially turn into commercial impact, including private-sector follow-on funding, new company formation, partnership with other government agencies, publications, inventions, and patents. In March, ARPA-E announced that many of its project teams have continued to advance their technologies: 76 have formed new companies; 131 have partnered with another government agency; and 145 teams have together raised more than $2.9 billion in private-sector follow-on funding to continue to advance their technology toward the market. 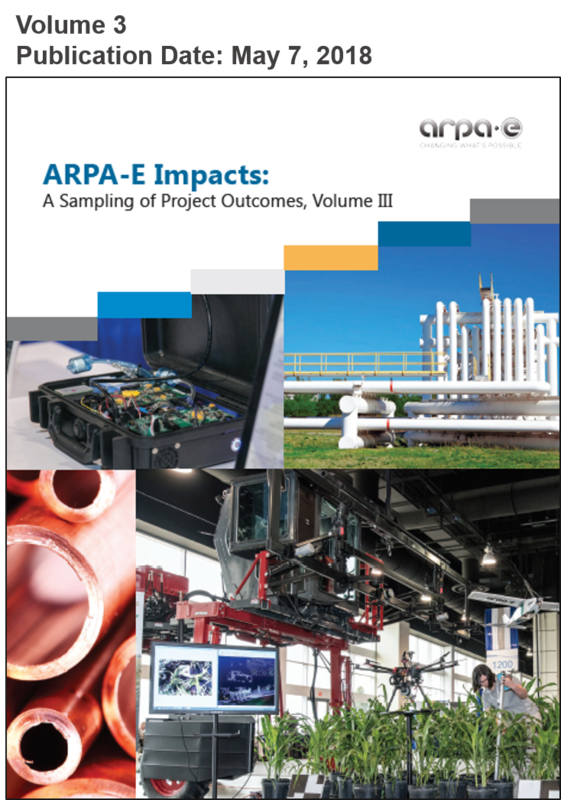 Moreover, as of March 2019, ARPA-E projects have helped advance scientific understanding and technological innovation through 2,489 peer-reviewed journal articles and 346 patents issued by the U.S. Patent and Trademark Office. These indicators demonstrate that ARPA-E’s approach to selecting, funding, and actively managing early-stage energy R&D continues to pay off, advancing the state of the art in energy science and engineering and defining new opportunities for commercialization of advanced energy technologies. As mandated by ARPA-E’s authorizing statute, the National Academy of Sciences completed in June 2017 a review of ARPA-E that provides an independent assessment of the impact of the agency over its first few years of operation. The report can be accessed on the NAS website here.